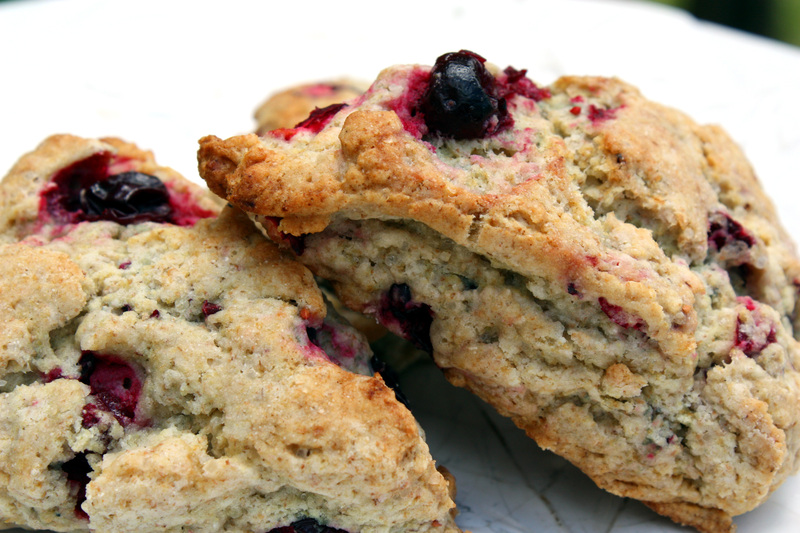 A basic cranberry scone recipe with a twist: Forsythia Syrup! I’m on the other side of the country now, on South Africa’s southwest coast, in Cape Town. 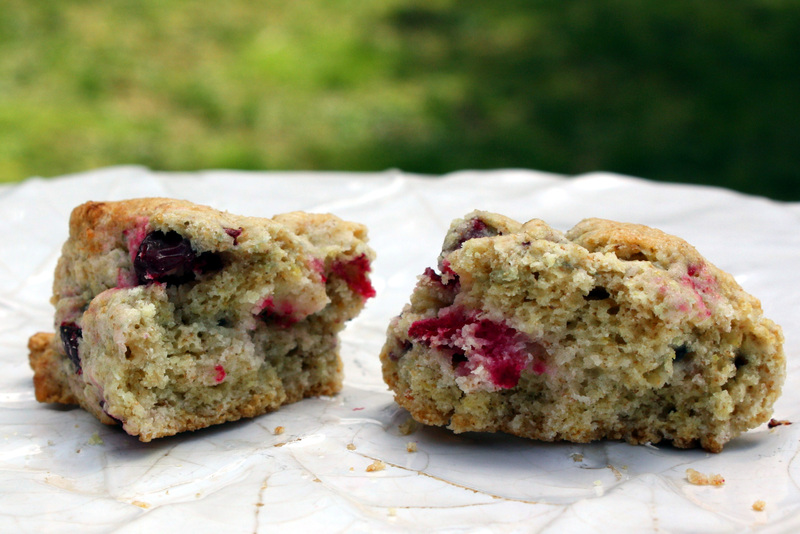 And while I don’t think cranberries even grow in Africa, and I’m not sure that forsythia does either, I am wishing I had some of these scones to take with me on a hike of Table Mountain. Could you guys bake some up and drop them in FedEx for me? Thanks bunches, or as we say down here, ndiyabulela. Adapted from Cranberry-Orange Scones by Local Kitchen. In a large bowl, combine flours, sugar, baking powder, baking soda and salt; whisk for approximately 1 minute until well blended. Add butter and rub between your fingertips until the mixture resembles coarse meal. Mix in cranberries (a few pulses in the food processor chops these nicely). Add the forsythia syrup, then gradually add the milk, tossing with a fork until moist clumps form. Stop adding liquid when it seems the dough will stay together; if the dough is too sticky, the scones will lose their shape upon cooking. If the dough seems crumbly and will not hold a shape, add more liquid 1 tbsp at a time. Turn the dough onto a lightly floured work surface (I find it easiest to split the dough into two portions at this point). Knead briefly to bind the dough; about 4 turns should be enough. Form the dough portion into a 1- to 2-inch thick round. Cut the round into 8 pie pieces with a sharp knife or pastry cutter. Transfer wedges to a parchment or silicone mat-lined baking sheet, spacing approximately 2 inches apart. Repeat the process with the other half of the dough. Using a pastry brush, glaze the tops of each wedge with forsythia syrup. Bake for 10 minutes (8 minutes convection), then turn pans in oven 180 degrees. Continue to bake for an additional 10-15 minutes (7-12 minutes convection), until the tops of the scones are golden brown. Transfer to wire rack to cool. Let cool 5 minutes before serving. The forsythia flavor was very, very subtle in these scones; I could tell it was there, but I’m not sure anyone else would. Next time I would up the amount a bit, but since it is a liquid, I’m not sure how much I can increase it without sacrificing flavor from the milk/cream. Nevertheless, I liked the subtle forsythia flavor; I’ll try this one again. I left the cranberries mostly whole in this version; I love the way they burst when you bite into one. Putting them into the food processor while frozen will chop many in half, some not at all, but you don’t get too many tiny pieces. Delicious! At room temperature, covered by a clean kitchen towel, for up to 3 days. Baked or unbaked scones freeze well for up to 3 months. Cranberries are in season in late Fall and early Winter; I always freeze a few bags for year-round use. Forsythia blooms in early Spring; the syrup will last for months in the refrigerator. I love the forsythia syrup twist. I’m going to try making this. That’s a great idea. I still have lots of cranberries left over from the stash I froze last winter (and am trying to use!) so this recipe comes at the perfect time. I bet it could be adapted using a mix of quinoa/sorghum flour (the staples in my kitchen these days).. either way, its right there on my (ever growing) list of things to make. The bursting cranberries are so pretty!